When I came in contact with Shivangini Pathak, a Clinical Psychologist and politically active woman of the Sepatpur Dynasty I was deeply impressed by her and decided that I ought to once more write about strong Indian women. I did it once in 2003, but I want to upgrade that information. There are so many impressive females that have left their footprints in the history of the Indian subcontinent. I wish here to name a few of them. One of them was Prem Mathur who became one of the first public female pilots in India in 1947. She wasn’t first though. Urmila Parekh and Rodaben Tata had flown already in 1940, but Prem Mathur succeeded in becoming pilot with Deccan Airways in 1948. In 1949 she won the National Air Race. Bachedri Pal is another impressive woman. In 1954 she climbed the Gangotri and Rudugaria Mountains and on May 23d 1984 she reached the peak on Mount Everest. In 1985 she led an Indo-Nepalese Everest expedition of all women and in 1994 a team of female rafters. Kalpana Chawla was the first astronaut in 1997 and among the successful writers we find Anita Desai, an Indian novelist and Professor of Humanities at the Massachusets Institute of Technology, prized for many books, among them Fire on the Mountain in 1978. 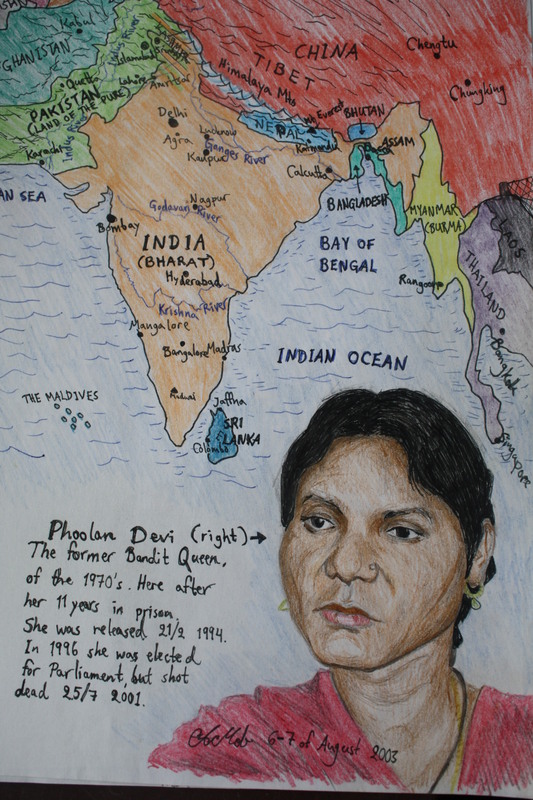 At the bottom of society Phoolan Devi was born in 1963. At the age of 11 she was married off to an older man, but ran away, became excluded from society, was kidnapped by bandits and became a criminal herself. In 1981 she killed 22 Thakur men for having raped her, was then imprisoned 1983-1994. She then married, became a Buddhist, became Member of Parliament, but was gunned down in 2001. Last, but not least there was Indira Gandhi. As daughter of Jawahrlal Nehru, she was elected Prime Minister of India in 1966. She then started the Green Revolution to improve the agriculture with fertilisers, better seed, more modern machinery etc. In the 1970’s she continued with the White Revolution – an increased milk production. This made her exceedingly popular. Her slogan was “Garibi Hatao”, Remove Poverty. Nationalised banks opened up in villages and even though 40% live below the poverty line no famine has occured since the 1940’s. Most Indians are extremely poor and almost 50% are illiterate. The slums have grown bigger and the middle class has become richer during Gandhi’s time. In 1984 the Sikhs in Punjab revolted, Indira Gandhi sent in troops and there was a massacre at the Golden Temple of Amritsar in July. As an act of revenge for the bloodbath her Sikh life guard assasinated her in October 1984. Indira Gandhi’s son Rajiv then became the next leader of the country and started improving the computer technology. He was shot dead in 1995 at a meeting and the Congress Party lost power to the Hindu nationalistic party Bharatiye Janata Party, the BJP in 1996 with Atal Behari Vajpayi as front figure. Even though this vast country is diversified, has many big problems, but an immensely long and rich history, that cultural wealth and richness of intelligence and capacity has fostered and molded many brilliant women. This entry was posted in Uncategorized by andersmoberg676. Bookmark the permalink.